Sense & Sensibility isn’t all sweetness & light. Through 4/27: Tue 7:30 PM, Wed 1 and 7:30 PM, Thu 7:30 PM, Fri 8 PM, Sat 2:30 and 8 PM, Sun 2:30 and 7 PM, Northlight Theatre, North Shore Center for the Performing Arts, 9501 Skokie Blvd., Skokie, 847-673-6300, northlight.org, $30-$50. The appetite for film, TV, and stage adaptations of Jane Austen's six completed novels apparently can't be sated. A serious case of Jane-mania has been raging among the Masterpiece Theatre set since the mid-1990s. I trace it back to two sources: (a) that scene in the 1995 BBC version of Pride and Prejudice in which Colin Firth's Mr. Darcy emerges from an impromptu swim wearing a clinging, translucent white shirt—at once discombobulating Jennifer Ehle's Elizabeth Bennet and converting millions of swooning viewers into lifelong Austenites—and (b) vicarious nostalgia for the well-mannered, well-ordered world Austen's characters allegedly inhabit. The latter stems from a misperception of Austen's books as pleasant little rom-coms filled with prim, polite men and women whose progress to the altar pauses only for the occasional formal ball, game of whist, minor misunderstanding, or humorous monologue by a delightfully dotty dowager. In fact, Austen's depiction of Regency England ain't all that quaint. In a world where money is inherited rather than made—and by men exclusively—even Austen's brightest and most talented heroines face certain doom unless they can secure a proper husband. Their suitors, meanwhile, are presumed to have no higher goal than either to guard their fortunes or marry into one. Though Austen is too pragmatic to be a revolutionary, she never fails to convey how stifling and unfair this system can feel for those living under it. 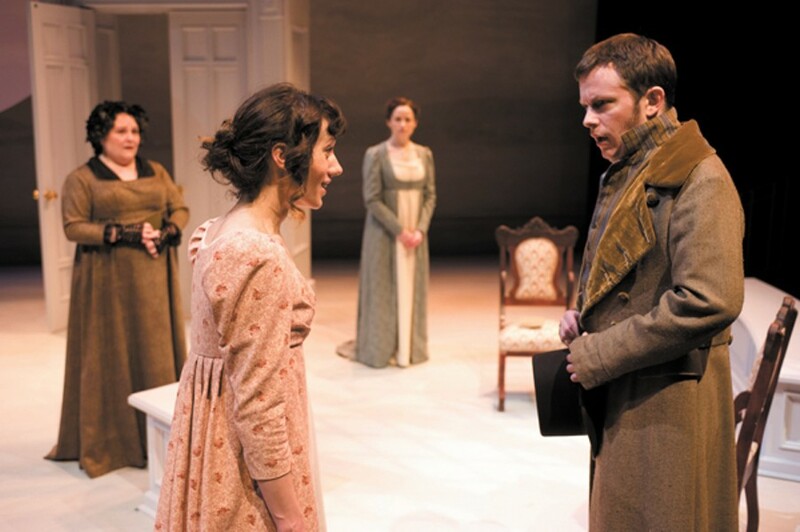 In Sense & Sensibility, Jon Jory's stage adaptation of which is now receiving a perceptive and well-acted world premiere at Northlight Theatre, the pages fairly bristle with indignation. Sisters Elinor and Marianne Dashwood—sense and sensibility, or reason and romance, respectively—can't inherit their dead father's estate because they've got ovaries. So everything goes to their weak-willed, miserly half brother, John, whose awful wife, Fanny, persuades him not to share even a little of the wealth. Thus the girls and their mother find themselves living in a small Devonshire cottage, where Marianne falls prey to the reckless and rakish John Willoughby while Elinor carries a torch for diffident Edward Ferrars. Neither man's benefactors will condone a match with a girl of their straitened means—and, in any case, Edward has already yoked himself to vulgar, conniving Lucy Steele. Thinking they've lost their last chances for happiness, both sisters suffer abominably. Marianne cries for scores of pages. Elinor holds it all in, making tart mental notes about the manners of those who flourish under the prevailing social order—namely, the insipid, the boorish, the deceitful, and the silly. Austen eventually rewards her heroines with happy endings, cleverly arranging for passionate Marianne to marry dependable Colonel Brandon for practical reasons, while practical Elinor conjugates with a suddenly disentangled Edward after a highly satisfying burst of pent-up passion. But the joy isn't unalloyed. For all their happiness, Elinor and Edward end the novel much less well off than their scheming peers. And Marianne's acceptance of Colonel Brandon isn't exactly the stuff fairy tales are made of. Austen tells us she gives him her hand "with no sentiment superior to strong esteem and lively friendship." Jory's adaptation smooths some sharp edges and sacrifices some subtleties. He makes Lucy more guileless and Willoughby less sympathetic, for instance, than they are in the original. But overall, he admirably captures the book's humor, spirit, and social comment, relying heavily on Austen's own dialogue but taking care to break the story into bits of action rather than chunks of prose so that it feels like we're watching a play and not an audiobook with costumes. Jory also directs here, and he's assembled a fine cast. There's not a weak performance in the bunch—and that includes minor roles such as that of the Dashwoods' coarse kinsman and neighbor, Sir John Middleton, played by V. Craig Heidenreich as a hale and hearty outdoorsman who lacks an inside voice. Penny Slusher manages to plant hints of panic and despair beneath the good-natured flutter of the Dashwood family matriarch, while Jay Whittaker somehow makes Colonel Brandon's sour-faced decency both poignant and compelling. But the show's success rests on the Dashwood sisters, and playing them can't be as easy as Heidi Kettenring and Helen Sadler make it look. Both characters have potentially irritating attributes—Elinor's tireless propriety, Marianne's excess of emotion. But Kettenring leavens Elinor's wet-blanket tendencies with sharp wit and a ready laugh, and Sadler conveys such sincerity that Marianne never looks like a fool or a drama queen, even when she's rhapsodizing about dead leaves.